Graphisurus fasciatus | Sam A. Baker State Park, Missouri. Graphisurus fasciatus is the commonest of the three species in this North American genus. It is easily distinguished from G. triangulifer by its smaller, narrower form, more mottled coloration, and lack of distinctive triangular-shaped black markings on the elytra. However, it can easily be confused with the third species in the genus G. despectus, which is nearly identical in size and coloration. From this latter species, G. fasciatus may be distinguished by the slightly darker ground color of the elytra (in G. despectus the elytra are more uniformly grayish) with the post-median dark marking of the elytra not very conspicuous (in G. despectus this marking and contrasts distinctly with the grayish elytra). Also, the tips of the elytra are distinctly emarginate (concave) in G. fasciatus but more subtruncate in G. despectus, and the scutellum in the former is pubescent (hairy) but glabrous (lacking hairs) in the latter. Host plant is also a clue as to the identity of this individual (a male, as distinguished by its very long antennae and lack of distinctly elongate ovipositor extending from the tip of the abdomen), as it was found on the trunk of a very large, recently wind-thrown black oak (Quercus velutina)—its preferred host genus. Graphisurus despectus, in contrast, appears to be associated almost exclusively with hickory (genus Carya). Both species, despite their relatively modest size (generally 10–15mm in length, excluding the female ovipositor), seem to prefer dead wood from the trunk and main branches of larger trees for larval development, mining just beneath the bark rather than in the wood itself. 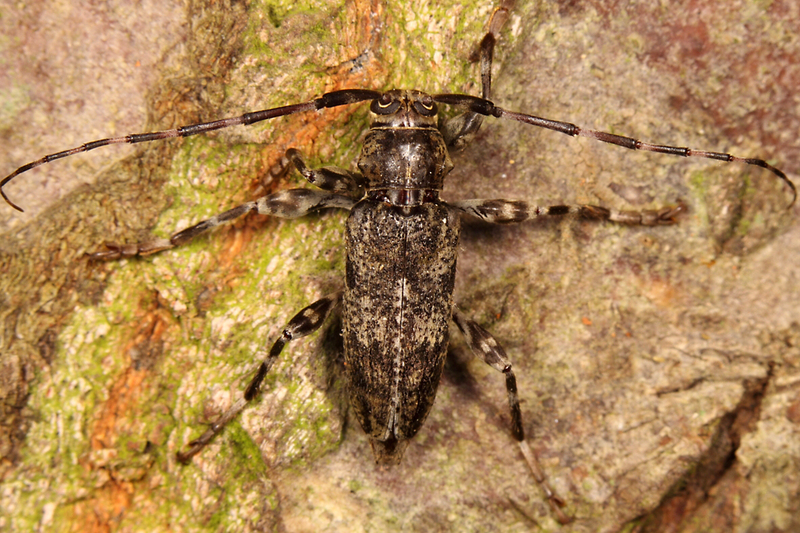 This entry was posted in Cerambycidae, Coleoptera and tagged beetles, entomology, insects, longhorned beetles, Missouri, nature, science, taxonomy. Bookmark the permalink. Amazing how any species can be so specific in their choice of host–not just an oak, not just a black oak, but a recently dead black oak! Ha – a very discriminating palate indeed!